Moving and unpacking has been a bit trying. Even though we now have twice the space, the new kitchen is so much smaller than our old one and our new stove is electric and not gas. We just can’t understand it when the butter in our cast iron skillet doesn’t immediately start melting! And there is still so much of our stuff still in boxes and I’m not used to all the clutter and it’s so hard to find things. So needless to say, I haven’t been doing a whole lot of cooking lately and I haven’t even attempted baking yet. The other night I did make some fantastic baked chicken breasts seasoned with cumin, coriander, Mexican chili powder and cinnamon. So good served with mashed potatoes and steamed broccoli…but that’s about it for my culinary adventures. Most of our meals have been quick pasta and take-out Pho from the Vietnamese restaurant around the corner. The one thing I have been making from scratch is breakfast. We’ve had some damn fine oatmeal, some deliciously sour grapefruits and some lovely Italian bread toasted up right and smeared with butter. But one of my favorite breakfast meals this week has been scrambled eggs. 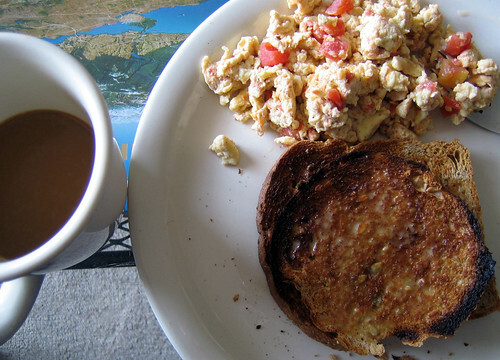 Really, why am I writing a recipe post on something as simple and a breakfast mainstay as scrambled eggs? Well, I’ve made it twice this past week and they make our new place feel a bit more like home and that’s a feeling I can definitely get used to. Crack 4 eggs into a bowl. Whisk with a fork and add in a few drops of water. This makes them extra fluffy. Trust me. Throw in a pinch of salt and a few good grindings of black pepper and gently whisk again. In a cast iron pan, throw in a small knob of butter and melt. When it’s nice and bubbly, slide in the eggs. Using the same fork, toss the mixture around. When it’s congeals slightly, add in about 3-4 large spoonfuls of salsa….the good fresh stuff (nothing from a jar or can!) and whisk again with the fork. Grate in about a tablespoon of sharp cheddar, mix again and then divide the mixture equally onto 2 plates. Serve with buttered toast and hot coffee. Eggs are so versatile and make a great meal likety-split. I usually use olive oil when I prepare eggs but I’m sure frying eggs with butter makes them taste so good. Yeah, gas stoves are quicker and do in fact, make better tasting food. And you can do all those fancy flambe tricks that the great chefs do with their gas burner. I, too, have an electric stove but when I’m ready to purchase my own stove, I think I’ll opt for gas. i only use water if i’m out of milk. milk makes them wayyyyyyy fluffier in my opinion. gas stoves are so much better. unfortunately, my current one is much hotter than you set it so it can be tricky to bake. i want to see pics of your new place! I do breakfast burritos with those ingredients quite often. So easy and good. Something more sinful and caloric is to drop clumps of Philadelphia cream cheese into scrambled eggs as they’re frying. So much creamy egginess, yum! I only do it twice a year so it doesn’t become a habit! I find the simple meals feel the most like home!! I can’t wait to move into a house with a gas line so I can buy and use my longed for AGA stove!!! I love your blog! Hew that sounds good. Though when scrambling, I’ve taken to throwing the egg mixture in at the same time as the butter and by the time the butter’s melted the eggs are pretty much done. It’s good! that sounds delicious. I haven’t used canned/jarred salsa in so long, I couldn’t tell you what it tastes like, fortunately. Glad to see you back! Too bad about the gas stove, they are SO much better, aren’t they. joanne, i’ve never tried eggs in olive oil but oh boy do i love eggs in butter! crystal, i remember hearing from someone that water was better than milk for fluffiness. maybe it’s time for a fluff-off! i do love eating these as burritos too, jennie! mmm and that cream cheese addition sure sounds deliciously evil. ha, that’s a good trick, jenny. i’ll have to try that out. liberalfoodie, really, there’s no need to go back to jarred salsas…ever! sara, i’m going through gas stove withdrawl symptoms! I’m a big fan of breakfast (any time of day) and I actually blogged about my fantastically simple chocolate chip pancakes. Scrambled eggs are not always my favorite, but I can understand the need for comfort food in a new place! yum. It’s something about breakfast that gets me tingly and excited also, regardless of time of the day. Having just moved and finally got back in the kitchen myself, I totally sympathize. Regarding the kitchen issues, first, the kitchen site for Apartment Therapy is hosting a contest for smallest, coolest kitchens. Probably too late for you to enter, but you might find some tips there in working with your new kitchen. Second, one way people get around the electric stove slow heating/cooling issue [if all four burners aren’t in use] is to heat one on high and one on low–that way, you can quickly go from high heat to low, just by moving the pan. Hope this helps.